This is the second in a series of articles by Captain Stewart detailing the technical specifications, manning, and operations of the U.S. Navy’s Fletcher class destroyers. My previous article (read Part 1 here) gave an overview of the U.S. Navy’s highly successful Fletcher class destroyer. In this article I will attempt to describe how a World War II Destroyer was manned and organized. Hopefully, it will provide some insight as to the duties performed by individual crew members during the war. My first assignment in the Navy was Engineering Officer of USS Halsey Powell (DD 686), a Fletcher class destroyer, and my experiences on that ship form the basis for this series on Fletchers. This discussion is centered on the ship’s organization as I remember it between 1956 and 1959. There were some differences in the way that the ships were organized in 1956 and the way that they were organized during the war. A major reason for these differences was the greater reliance on radar that developed during the war and the establishment of the Combat Information Center (CIC). These differences will be described as we go along. Note that both the terms “is” and “was” are used interchangeably in this discussion because many of these practices still exist today. The Fletcher class destroyers had a wartime complement of 329 personnel. That number was necessary to allow around the clock manning of gun mounts, repair parties, and other watch stations. The peacetime manning was 14 officers and 236 enlisted men. 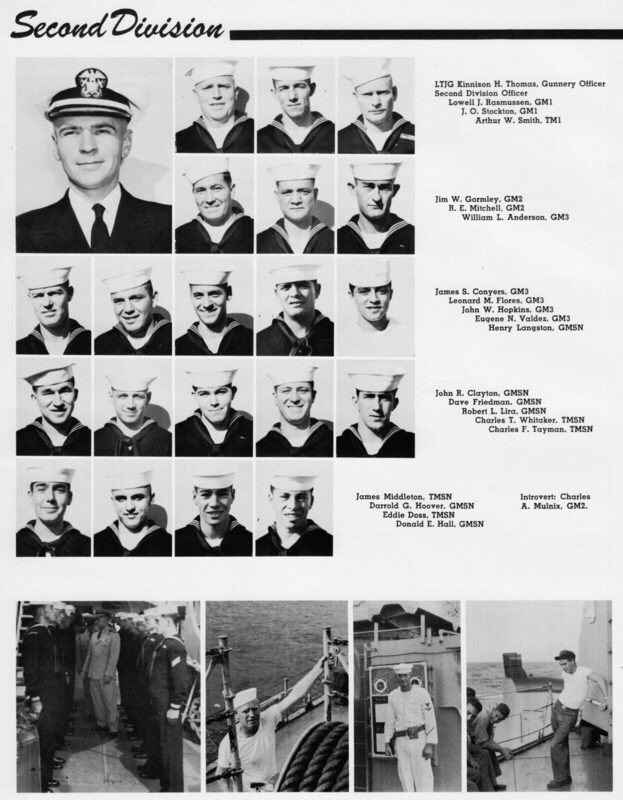 About 12 of the enlisted men were Chief Petty Officers. Naval philosophy in those days was to man the ships with a large number of personnel and little use was made of automatic controls or other labor saving devices. Much of this philosophy was a carry over from the days of sailing ships. The wartime philosophy was essentially that “manpower was cheaper than technology”. The Commanding Officer (CO) of a destroyer under peacetime conditions is normally a Commander with 15 to 18 years of commissioned service. During World War II, the commanding officer was frequently a Lieutenant Commander with far less experience. I served under a Destroyer Squadron Commander in 1963-64 who had been the Commanding Officer of USS Hazlewood (DD 531), a Fletcher Class Destroyer, in 1945 as a Lieutenant Commander when he was only 5 years out of the Naval Academy. Regardless of rank, the Commanding Officer was always referred to as “Captain.” He bears total responsibility for the ship and had commensurate authority over everyone on board. He was always on call when the ship was underway. He had non-judicial powers over all personnel under his command (Referred to as “Captain’s Mast”) or he could convene a summary or special court martial. His direct superior in the chain of command was his squadron or division commander who was normally a Captain with the honorary title of “Commodore”. If the ship was designated as a flagship, accommodations were provided on board for the Commodore and his staff. The Executive Officer (XO) is the second in command on the ship. He functions as the administrator of the ship and has overall responsibility for all personnel on board. The Executive Officer is the person who is responsible for making things happen. He promulgates the plan of the day and oversees virtually every evolution. He does not normally stand watch underway. On many smaller ships, he usually doubles as the ship’s navigator. More about this later. The XO is often the resident “bad guy” in the wardroom because many COs like to play the “Good Cop/Bad Cop” game. Frequently a junior officer was assigned as the Administrative Officer or Ship Secretary with additional duty as X Division Officer. Ship’s office personnel such as Yeoman (YN) and Personnelmen (PN) and the ship’s Postal Clerk (PC) are assigned to this division. The ship’s Master at Arms force reports directly to the Executive Officer. These are senior petty officers who function as the ship’s police force. On a small ship, this is usually a collateral duty. Aboard Halsey Powell, the Chief Boatswain’s Mate also functioned as the Chief Master at Arms. The ship’s Hospital Corpsman (HM) also normally reported directly to the Executive Officer. 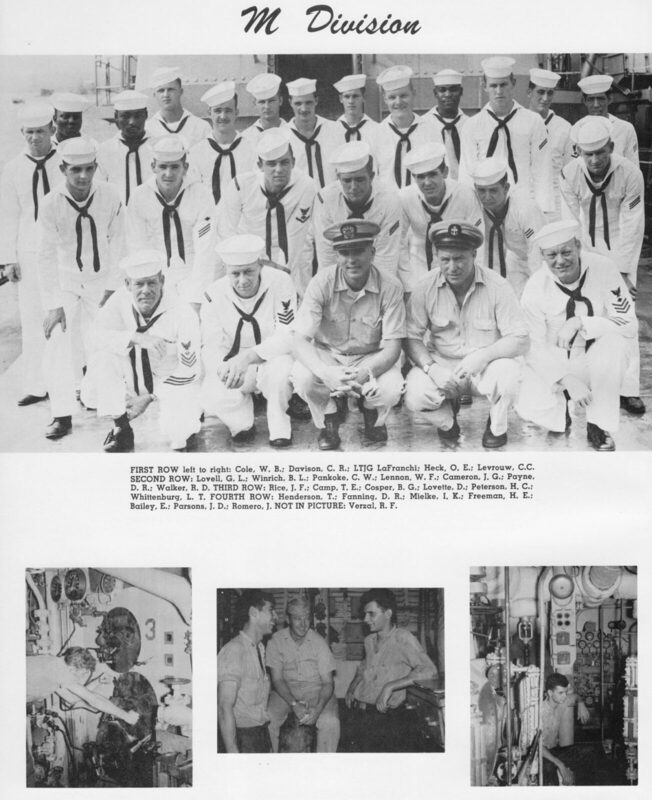 Aboard a destroyer, the Chief Hospital Corpsman (HMC, referred to as “Doc”) is the only medical person assigned, although there was a Squadron Doctor who rode the flagship and was available for advice. During World War II this rating was called “Pharmacists Mate”. The Navigator is responsible for determining the ship’s position and making recommendations as to the appropriate course of action to the commanding officer. He is assisted by personnel of the Quartermaster (QM) rating. On some ships a junior officer is assigned as navigator. But on destroyers and smaller vessels the Executive Officer often doubles as the navigator. During both of my XO tours, I served as navigator. One reason for this was that it kept me involved in the operational picture. Also, since my primary experience was in engineering, it served as excellent preparation for command. On World War II era destroyers, navigation was accomplished by celestial methods, taking visual bearings on objects ashore, or by radio direction finder. With the introduction of radar, another useful method became available when the ship was within radar range of shore. Radio direction finders were eventually replaced by Loran A. Of course, ships today are fitted with Global Positioning (GPS), Electronic Chart Display (ECDIS) and other more advanced equipment. Below this level, the ship was organized into departments. There were three major operational departments i.e., Operations, Gunnery and Engineering. Aboard destroyers, these were all Lieutenants’ billets. However in 1956 there was an acute shortage of Lieutenants in the Navy and therefore each ship was only provided with one, who was invariably assigned as the Operations Officer and Senior Watch Officer. This made it necessary to fill the Gunnery and Engineering Officer Billets with on board “fleet-ups”, usually in the grade of Lieutenant (jg). This was to have a great impact upon my own career in the navy. This practice no longer exists today. A fleet destroyer will normally have all three major department head billets filled by a Lieutenant Commander or fairly senior Lieutenant. Department heads reported to XO for all administrative matters related to their departments. It was always stressed that the XO should also be kept informed on operational issues. However the department heads were directly answerable to the CO for all purely operational matters relating to their departments. The Operations Officer billet did not specifically exist at the beginning of World War II. The need for a separate department responsible for the collection, display, and dissemination of combat information and intelligence became apparent as further use was made of radar and the establishment of a Combat Information Center (CIC) as the central nerve center on the ship. Therefore the functions of the Communications Officer, CIC Officer, and Electronic Material Officer (EMO) were all brought under the Operations Officer. Communications had previously been a “stand alone” department and electronics repair had belonged to the Chief Engineer. By 1956 the Operations Officer had evolved into the principle adviser to the CO as to operational matters. He was responsible for reading and interpreting all operation orders (OP-Orders) and determining what the ship was supposed to do next. The billet was normally assigned to a Lieutenant with four or five years of sea duty. As Senior Watch Officer, he had the responsibility for the training and assignment of junior officers, and in some cases CPOs to underway and in port watch stations. On Halsey Powell, our Ops Officer was also assigned as navigator, although that was not universal practice aboard destroyers. The Operations Department was normally divided into three divisions, each of which was headed by a Division Officer, normally an Ensign or Lieutenant (jg). Radioman (RM) – Responsible for all electronic means of exterior communications. Available methods included voice radio, teletype, and the old fashioned Morse Code key. Signalman (SM) – These people stood watch on the signal bridge. They were responsible for visual communications between ships by flashing light, flaghoist, or semaphore. Quartermaster (QM) – The only reason these people were assigned to this division aboard Halsey Powell was that the Operations Officer was also the navigator. Quartermasters perform a variety of bridge duties. As well as providing assistance to the navigator, they maintain the Deck Log while the ship is underway and coordinate a number of other bridge functions. Frequently the helmsman duties when entering and leaving port or conducting underway replenishment are assigned to a Quartermaster. Radarman (RD) – This was a new rating that was established during World War II. The RD ratings stood watch in the Combat Information Center (CIC). The CIC included radar repeaters, voice radios, electronic warfare equipment, plotting boards, logging facilities, etc. Facilities were provided for collection, display, evaluation, and dissemination of information and making appropriate recommendations to the command (and in some cases Weapons Control). During routine steaming operations, CIC was responsible for radar navigation and tracking of routine surface contacts and making appropriate recommendations to the Officer of the Deck. Under these conditions, a commissioned CIC Watch Officer (CICWO) was assigned. This duty normally fell to the most junior three Ensigns in the wardroom. I did not like this practice and I always made sure that more experienced officers were assigned to these duties when I became a commanding officer myself. Electronics Technician (ET) – These sailors were responsible for maintenance of all exterior communication, navigation, and radar equipment. They did not stand regular watches but they were the people you called when something failed to operate properly. During World War II, these functions had belonged to the Chief Engineer. But by 1956 they were more appropriately assigned to the Ops Department. Gunnery Officer – Or “Gun Boss” was responsible for operation and maintenance of all of the ship’s armament plus all matters relating to deck seamanship. In later years with the advent of missiles, the title of this billet became “Weapons Officer.” The Gunnery Department aboard Halsey Powell included three divisions, i.e. First (Deck), Second (Guns), and Fox (Fire Control, Sonar, and Anti-Submarine Armament). Seaman/Seaman Apprentice (SN/SA) – This takes some explanation. 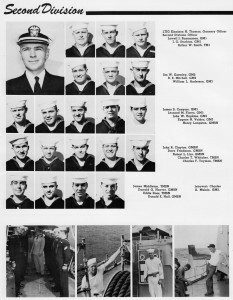 These sailors were generally referred to as “non-rated” personnel and they could be assigned duties in any of the non-engineering divisions. Most were assigned to the Deck Force. All sailors initially attended Boot Camp where they held the rating of Seaman Recruit (SR). Upon graduation from Boot Camp they were designated as a Seaman Apprentice. After a year on board they were advanced to the grade of Seaman (SN), from which they could “strike for” assignment to other ratings. Some SAs were sent through advanced schooling for a particular rating and came aboard as “Designated Strikers” such as GMSN, RMSN, etc. Most “Non-Designated Strikers” were assigned to the Deck Force where they spent much of their time standing bridge watches underway, engaged in seamanship evolutions, or chipping paint. Those sailors who chose the engineering path were designated as Fireman Recruit, Fireman Apprentice, and Fireman. They followed exactly the same path but they were only assigned to the Engineering Department. Second Division was headed by the Assistant Gunnery Officer. 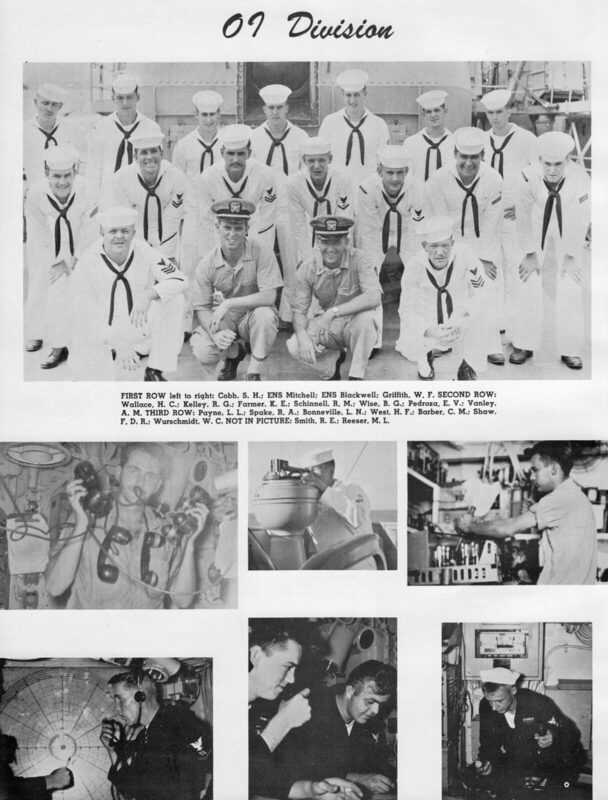 Sailors in this division were responsible for operation and maintenance of all of the ship’s armament and stowage of ammunition except for torpedoes and anti-submarine weaponry. The only rating in this division was the Gunners Mate (GM). Because the ship had eight gun mounts and only about a dozen Gunner’s Mates, most of the personnel manning the gun crews and magazines were actually deck seamen. At least one GM was assigned to each mount as the Mount Captain and another would be in charge of loading operations. The Chief Gunner’s Mate (GMC) normally acted as a roving troubleshooter. Fire Control Technician (FT) – Responsible for operation and maintenance of all of the ships gunfire control systems including fire control radar, computer, and electrical transmission systems. Torpedoman (TM) – Responsible for operation and maintenance of the ships torpedoes, depth charges, and Hegehogs. Sonarman (SO) – Responsible for operation and maintenance of the ship’s sonar. Engineering Officer – This was my assignment. The Chief Engineer bears responsibility for operation of the ship’s engineering plant, electrical generation and distribution, auxiliary machinery, and interior communications. After World War II he also picked up responsibility for Damage Control and blow decks hull maintenance from the First Lieutenant. If there was ever any doubt about who was responsible for a piece of equipment on the ship, it belonged to the Chief Engineer. He was also responsible for coordination of shipyard overhauls or periods (availabilities) alongside a tender. His principal assistants were the Main Propulsion Assistant (MPA) and Damage Control Assistant (DCA). His office was referred to as the “Log Room” and he would designate one bright young sailor as the “Log Room Yeoman” to help with the paperwork. Engineers were always referred to as “Snipes.” This term originated in the British Navy when a visiting Admiral said that the engine room on a battleship resembled a “snipe marsh”. Boiler Technician (BT) – This was a fancy name for what was called a “Water Tender” in the old coal fired Navy. The BT rating was responsible for operation and maintenance of the ship’s boilers and all associated equipment in the two fire rooms. Normally half of the sailors in this division would be assigned to each space. 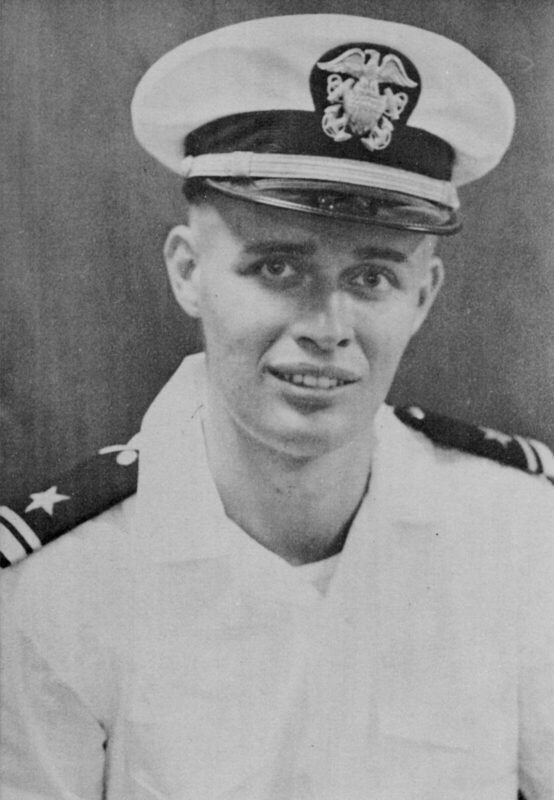 One Petty Officer was designated as the “Oil King”. He was responsible for all fuel transfer operations plus chemical testing and treatment of the ship’s boiler water. Normally he was a non-watchstander and he was usually provided with at least one full time assistant. All records of boiler water treatment and fuel usage were kept in an office referred to as the “Oil Shack”. The BT rating was considered to have the hottest and dirtiest jobs in the navy. Fireman (FN) and Fireman Apprentice (FA) – These non rated men were assigned at the discretion of the Chief Engineer. The Damage Control Assistant (DCA) was in charge of R Division. It was a very diverse division that was comprised of several ratings. 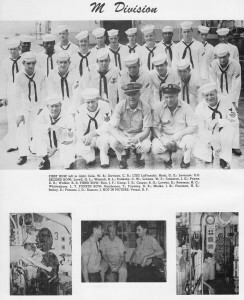 Shipfitter (SF) and Damage Controlmen (DC) comprised the Damage Control gang on the ship. This group was responsible for all general hull fittings such as watertight doors and hatches, ventilation system closures, general plumbing, etc. This group normally had one or more qualified welders assigned. The group was also responsible for all fire fighting and dewatering equipment. Machinery Repairman (MR) were in charge of the Machine Shop. He was usually the only qualified lathe operator on board. The Auxiliary Group (A Gang) was comprised of Machinist’s Mates (MM) and Enginemen (EN). Enginemen were diesel engine specialists who took care of boat engines and the emergency diesel generator. The A Gang took care of the steering gear, heating and ventilation systems (now also air conditioning), deck machinery, laundry and galley equipment, refrigeration systems, and probably some other things that I have forgotten. Electrician’s Mates (EM) – Were responsible for the entire ships electrical and distribution systems including all power and lighting equipment. Interior Communications Electricians (IC) were responsible for all interior communications equipment including telephone, indicating and alarm systems, announcing systems, and the ship’s gyro compass. Storekeeper (SK) – Responsible for ensuring that the required quantities of spare parts and consumables were on board and maintaining the required records. 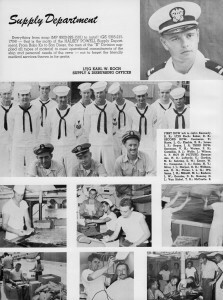 Comissaryman (CS) – These were the ship’s cooks. Obviously they were the people who were most likely to take heat from the other crew members for their efforts, or lack thereof. The CS rating who was responsible for the dry provisions and refrigerated storerooms was referred to as the “Jack of the Dust”. Ship Servicemen – (SH) – Served as laundry men and operated the ship’s store and barber shop. Disbursing Clerk (DK) – Assisted the Supply Officer in performing his paymaster functions. 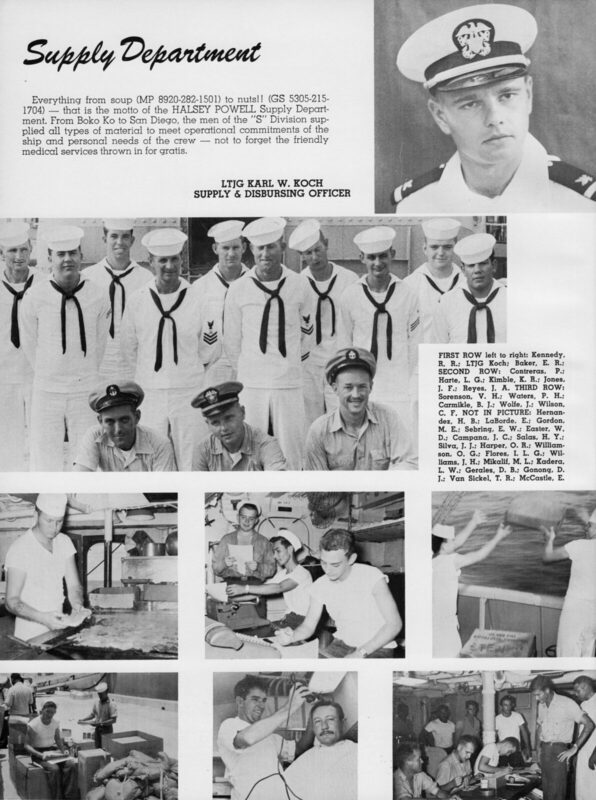 Stewards (SD) – Ran the Wardroom Mess and provided valet service for the officers. In those days they were nearly all Filipinos. This rating has since been eliminated and these duties are now performed by Culinary Specialists who are assigned to the Wardroom Mess. Naval officers are required to pay for their own meals. The Wardroom mess was run like a small business and each officer had to pay a monthly mess bill of about $25 to $35, a lot of money in those days. All wardroom provisions had to be purchased from the General Mess or other sources ashore. The job of Mess Treasurer rotated among the junior officers. However the Supply Officer served as the permanent mess caterer, a place where he frequently took a lot of heat. He was normally seated at the opposite end of the wardroom table from the Captain, where it was convenient for everyone to glare at him. This organization sounds very complex to the outsider. But it must be recognized that a naval vessel must remain at sea for extended periods and it has to function as a small self supporting community. The individual rating groups are very specialized. But that is particularly necessary in wartime because it greatly simplifies the training program.